No naked new phones! Last week was the Christmas for Apple tech-lovers everywhere: the announcement of the newest iPhones. We’re super on our tech news, so the iPhone cases for the brand new models are already available in your Artist Shop! With these new phones still trending, preorders still coming in, and customers looking for a cool case to protect that expensive new screen, now’s the perfect time to add these new cases to your product lineup. Big new phone announcements only happen once a year for Apple, so this is a promo opportunity you don’t want to miss out on. Here are a few ways you can promote the new iPhone cases in your Shop to really take advantage of the new phone announcement! First things first: add phone cases, dang it! Seems obvious, but it must be said. If you have yet to add phone cases to your Shop, add them sooner rather than later. (And if you already had phone cases in your Shop, all you have to do is promote! The new iPhone model cases are already magically added.) News about the new iPhones is still buzzing and people are still pre-ordering their own. Speaking of pre-ordering, heads-up: the iPhone XS and XS Max cases don’t ship until late September and the XR ships in early November, so keep this in mind when you spread the word. The Daily Carnage recently had a newsletter about using perception to influence conversions. They mention that “If someone buys a smartphone for $1000, immediately introduce headphones for $50. 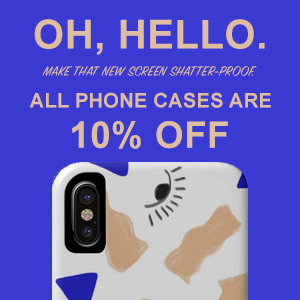 It’s kind of like “I already spent $1000, what’s another $50.” This is one reason why running a phone case promo while the new iPhones are flying off the digital shelves can help you out. Customers have already dropped a pretty penny on their new phone; at this point, 1: what’s $27 more dollars (especially if the phone case is on sale), and 2: the last thing they want to do is crack that new phone screen because they didn’t have a case. Pro tip: include all phone cases in this promo, but push the new iPhone cases. You don’t want to alienate customers who are just now buying the iPhone 8 and want a good deal! Just a few Artist Shops with designs on the new iPhone cases! From left to right: Kristin Tipping, Melinda Beck, Obinsun, Jay Draws Things, St. Baldrick’s Foundation. Do you have designs that sell really well but aren’t available on phone cases in your Shop? Or, has it been a minute since you’ve added new designs to your Artist Shop? Add some brand new designs to phone cases in your Artist Shop and announce these new additions on social using mockups of the brand new models. 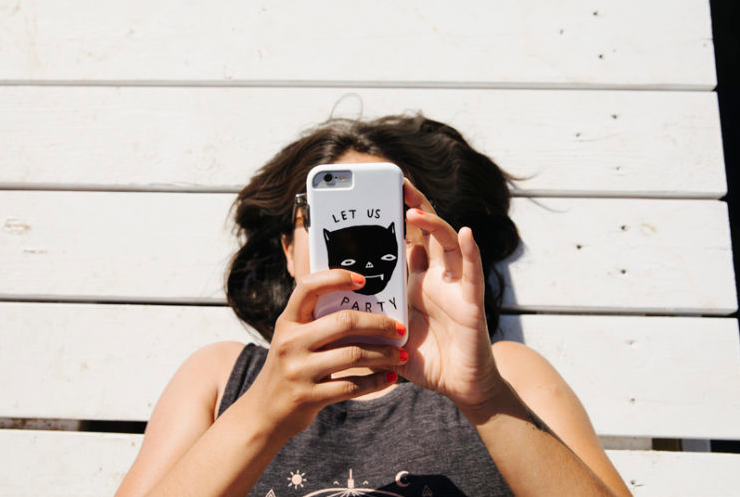 Old phone case, but a great example of how to feature your phone cases in a clever way through lifestyle imagery (design is “Party Bat” by Jillian Fisher). Creating a custom GIF featuring your new iPhone cases is an eye-catching way of promoting your new iPhone cases and Shop. An example of a VERY quick & simple phone case promo image you can make using a mockup of phone cases from your Artist Shop. Purchase stock mockup photos. If you don’t want to wait to create lifestyle images with samples you order, Creative Market already has a few nice assets you can purchase to create some solid promotional images for your new iPhone cases. Pair a mockup with fun, custom illustrations. The illustrations around the promotional photo below make it unique, eye-catching, artistic and, most importantly, sets it apart. While you only have mockups available, try featuring an image like this with illustrations all around the iPhone case. 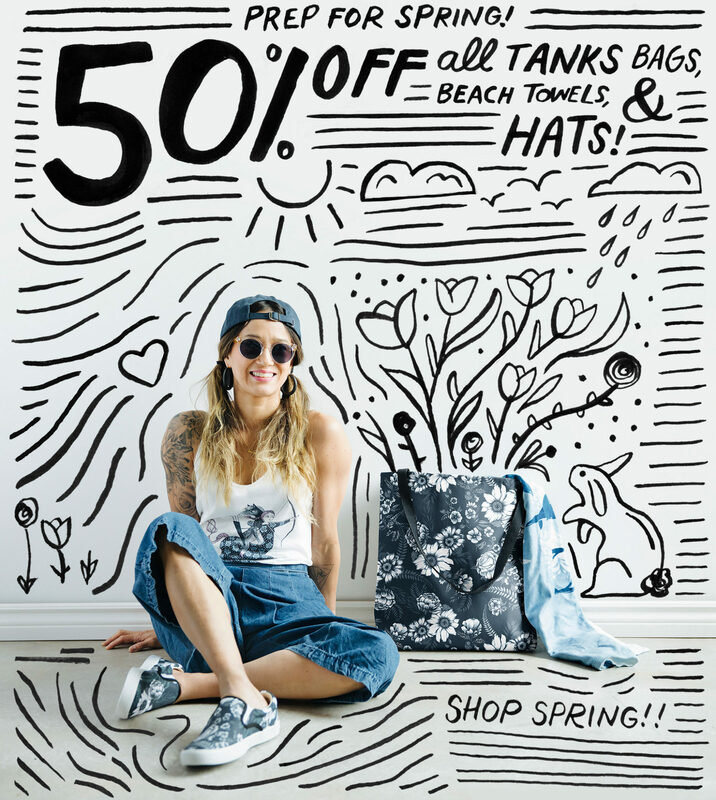 A great example of doodles over a simple promotional image that Katie Lukes created for one of our pre-spring sales. Whether you have a blog for your Artist Shop or you just make creative, fun posts via your social channels, this is a great time to get creative with content marketing. Promote your phone cases in a fun, clever way; perhaps make a Spotify playlist for fall with a featured image that shows someone listening to music on a phone wrapped up in one of YOUR phone cases. Or write a blog post recommending the five awesome podcasts you’re listening to right now and make the featured image of the post feature your designs on mocked up new iPhone cases that you can link to in the post. Your best-sellers are already attention-grabbers. Capitalize on that by showing customers what they look like on sleek new phone cases. In your promotional materials on social, use mockups from your Shop to show off what your best-selling designs look like on phone cases. Featured illustration made by Katie Lukes. Very good info. But overwhelming for me. A lot of information for me to take in, I’m still new to all of this stuff.